Open NOW-5/2 & 5/25-6/1 & Mem Day Wk! 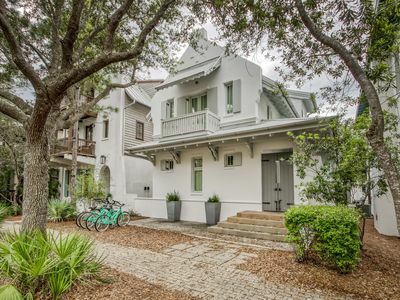 3BD/3BA Sleeps 10. 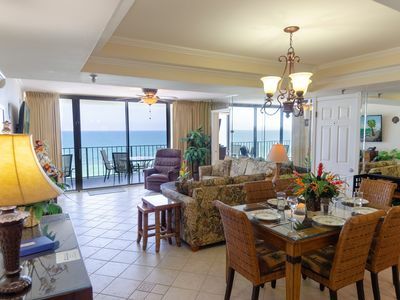 2 Oceanfront Masters, Huge Balcony! 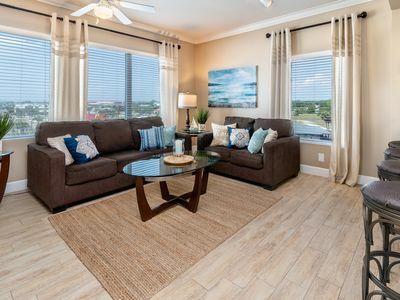 Come "Sail Away" to your perfect place in paradise in Watercrest 607! 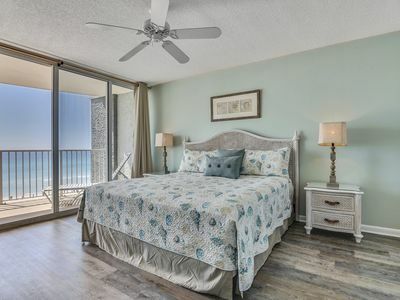 You are in for a real treat with TWO Gulf Front Master Suites! With a huge great room and 3 spacious bedrooms and bathrooms, you'll have plenty of room to relax and enjoy your vacation. This property comfortably accommodates up to 10 guests in 3 bedrooms and 3 bathrooms. There are 2 king beds, one queen bed, a set of bunk beds for the youngsters and a queen sleeper sofa. There's also a pack n' play available. 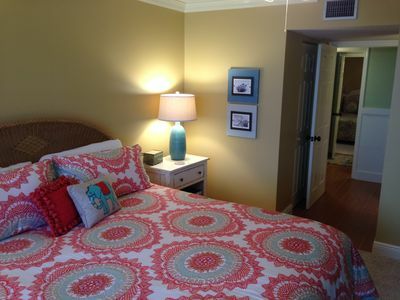 If you need even more space, ask us about our other two 3BR/3BA condos in the same building. We know you'll enjoy your days at the beach as much as we do. Book NOW, you won't be disappointed! Sail Away's topical décor with a nautical flair will put you in the mood to relax. 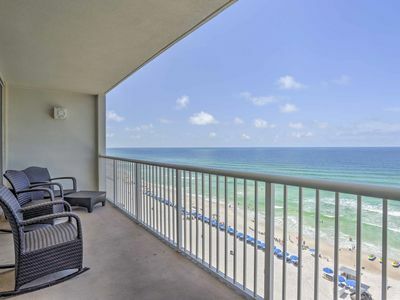 This fabulous sixth floor unit has two large gulf front master suites and a large third bedroom. 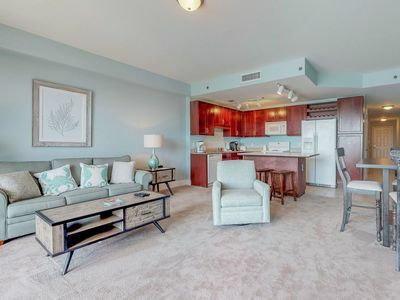 With 1441 square feet of living space and a spacious 248 square foot gulf front balcony that overlooks the pool and the beach, you'll have plenty of room to stretch out. 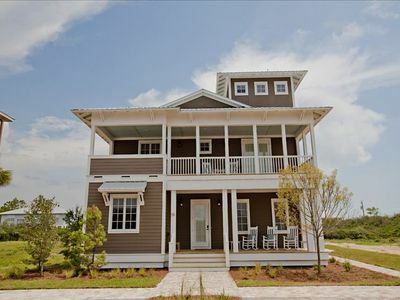 This is one of the best floor plans on the beach. The condo was completely renovated in 2016 in conjunction with the building's exterior renovation. All the ceilings were redone, the unit was completely painted, new drapes were installed and more. Watercrest is an elegant eighteen-story high-rise with only ten condos per floor. The WaterCrest building was completely renovated in 2016 with a new roof, new windows, new exterior and deck painting, pool renovation and much more. It's like a new building! The building has four elevators so, you won't have to wait long for an elevator. Park in your own private covered parking space adjacent to the building. Parking for additional vehicles is also available. 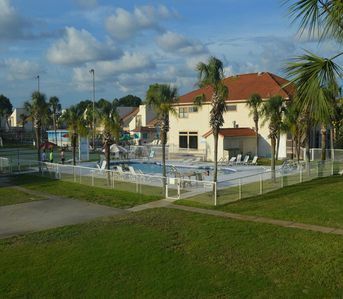 Watercrest has a large oceanfront pool, a large hot tub and a kiddie pool. Our Tiki Bar is pool side and offers quick snacks, drinks and beach goods. The beach service has beach chairs and all the beach toys you might want for rent by the day or week. The fitness center is available for all guests to enjoy. Tennis, shuffleboard and indoor racquet ball courts are also available on property. If you are having a big family get together or need meeting space, there is a large community room that is available for rental, too. Onsite security with cameras strategically placed around the property keeps an eye out to help keep everyone safe and secure. WaterCrest is conveniently located on the 'quiet' end of the beach near St. Andrews State Park, there's almost never a traffic jam here. Many great restaurants, recreational activities and golf courses are located nearby. All of our king and queen beds have memory foam mattress toppers for added comfort. With our high thread count sheets, you'll feel like you're sleeping on a cloud. Our bath linens are a cut above as well. So, relax with us and enjoy your time in the sun! The private balcony faces east for relaxing in the sun during the day and for enjoying stunning sunset views every evening. With a chaise lounge and plenty of tables and chairs you can entertain or just enjoy it by yourself. The emerald waters of the Gulf of Mexico and the gentle family friendly waves will captivate you. The soft sugar white sand is so inviting. The view is incredible. Watching the sunset from the balcony is the perfect way to end the day! 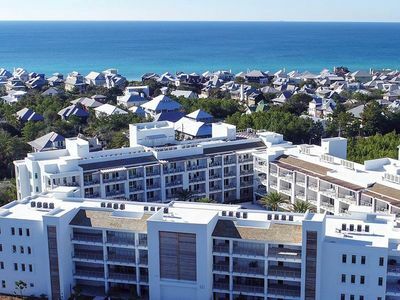 The beach, pools and sun-deck are just steps away. You'll have fun swimming, building sandcastles, walking on the beach, looking for shells, sunbathing, and much more. On-site beach rental service offers jet ski rentals, banana boat rides, parasailing and beach chair rentals right at your door step. 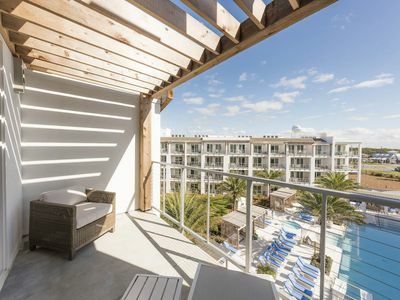 After a day at the beach, the beachfront pool complex is a cool oasis. The huge main pool is simply stunning. It's heated during the winter, too. The hot tub is away from the action of the pool for maximum relaxation. The kiddie pool is perfect for the little ones and their parents to splash and play. The great room has a comfortable tropical print queen sleeper sofa and love seat, a comfy leather recliner and a man-sized 52 inch wide screen LED Flat Panel TV. 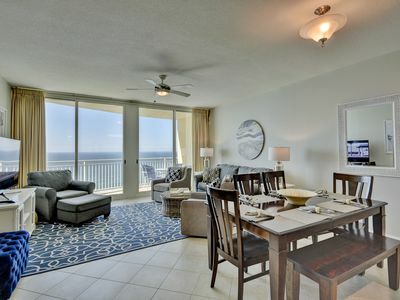 Enjoy the ocean view from the comfort of the great room or step out onto your own private balcony for a wide-angle view of the majestic Gulf of Mexico. Relax and enjoy TV or a DVD. Listen to music or stretch out with a 'beach novel' from our collection. Hey, if you are not finished with your book when you have to go home, take it with you to remember us by! Relax, relax, relax, enjoy! The well-equipped gourmet kitchen has plenty of cookware, cooking utensils, dishes, glasses and flatware so you can prepare breakfast, lunch, or dinner right at your fingertips. The modern kitchen features granite counter tops, updated appliances and Kraft Maid brand cabinetry. We have both Keurig and drip coffee machines. Dine inside or outside, it's up to you! Best of all there's no waiting in line and no reservations required when you vacation in your own condo instead of staying in a hotel room! The dining room has a beautiful tray ceiling and is elegantly appointed with a glass topped tropically inspired table with six beautifully upholstered chairs and three swivel bar stools at the breakfast bar. If you don't feel like cooking, it's just a short trip to the World Famous Captain Anderson's and Scampi's. Other great restaurants nearby include Hammerhead Fred's,. Mellow Mushroom, Schooner's, Spinnaker and many more. There's nothing quite like sleeping in a bedroom on the beach! Sleep to the gentle sounds of the ocean in the Captain's Stateroom Suite's luxurious king-sized pineapple accented poster bed. We call this The Captain's Stateroom because you'll feel like the captain of the ship here. The nautical décor with a tropical twist is truly unique. This bedroom has floor to ceiling windows overlooking the sea and a sliding door that opens onto the balcony. The luxurious king bed has a memory foam topper and high thread count sheets to make you feel like you are sleeping on a cloud. Enjoy the flat panel LCD TV and DVD player or just enjoy the view out those huge windows. The view from here is spectacular. The private en-suite bathroom has a tub/shower combo with shower massage and a single vanity with a hair dryer. There is also a large walk in closet with plenty of storage. Sleep “on the beach” in our First Mate's Stateroom, too. The First Mate's Stateroom Suite is your second beach front master with a beautiful king-sized sleigh bed. 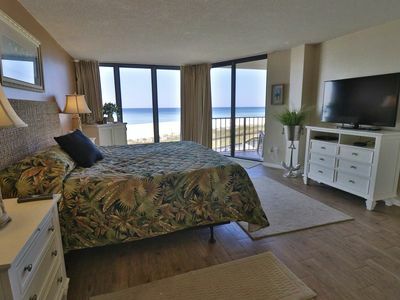 This room has a sliding glass door opening on to the balcony and floor to ceiling windows overlooking the beach. The electronics package in this room includes an LCD flat panel TV. The large private en-suite bathroom has a large tub/shower complete with shower massage and a separate vanity area with a hair dryer. This room has three closets for storing all your things. The Crew's Quarters third bedroom has a coastal cottage feel with a queen sized poster bed and bunk bed set for the kids. You'll love the whimsical decor and all the extra sleeping space. Bunk beds are for use only be persons weighing less than 100 pounds, thans! This room has a 24' LCD TV and DVD player for your enjoyment. 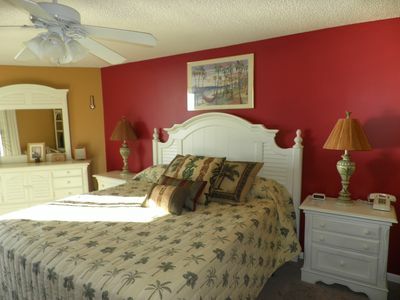 The large third bathroom is located across the hall from this bedroom and has a tub/shower combination with shower massage and a single vanity with hair dryer. 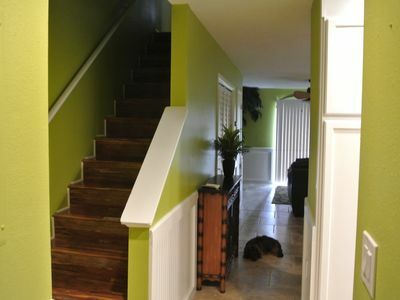 The laundry closet is adjacent to the third bathroom and has a large stack washer and dryer. An iron and ironing board are also available for you to use. Sail Away provides complimentary Wi-Fi access and Cable TV in all rooms so you can stay connected while you are here. Why should you rent from us? Because what you see on our site is what you get! Yes, these are the actual photos of the unit where you will stay!! 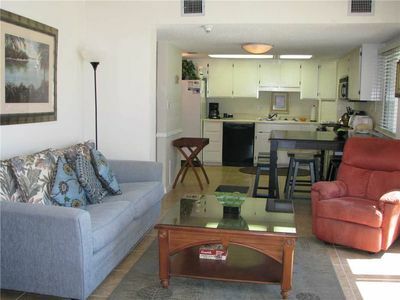 We represent the owners of this unit in order to provide our guests with the best possible vacation rental experience. 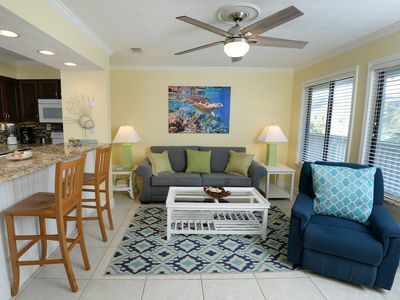 So, you get the best of both worlds, a rental by owner AND a professional management company that can take care of your vacation from reservation to check in, to check out and beyond. We hope you will visit our little piece of paradise soon. We know you will love it as much as we do. Perfect for SNOWBIRDS! Now booking Jan & Feb! 4th floor/super views/Clean! Book Now For Memorial Day Great Rates! Beach Chairs Included! Read Our Reviews! Mistral 24🌴☀- Gulf Front, SPECTACULAR Views! 2 bed/2 bath + bunks, sleeps 8. 1bd/1ba~FREE Activities~NEWLY renovated condo!! Gorgeous views of the Gulf! 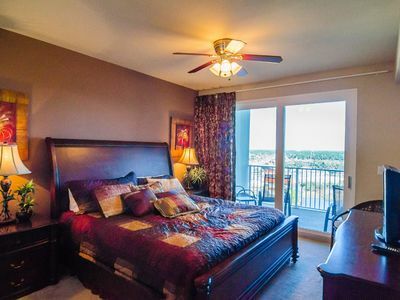 The Pointe 236C - Booking spring vacays, now! 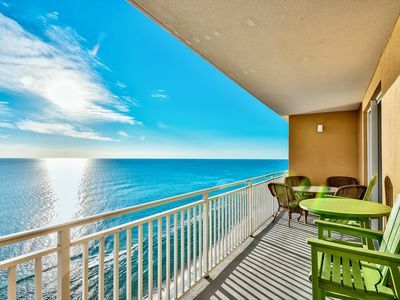 The Pointe 211B - Booking spring vacays, now! 3 BR Edgewater 1st Floor. Nicest Unit at Edgewater! 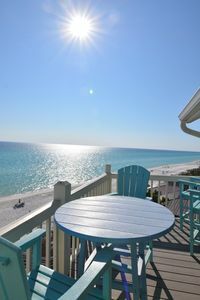 Oceanfront Panama City Beach Resort Condo w/Pool! 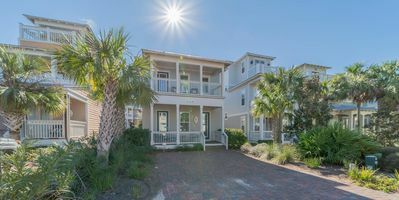 Papa's Place, Seacrest Beach, Pet Friendly! Community Pool! Complimentary Tram Service! UNIT 1202E! BOOK ONLINE & SAVE!